I love just browsing the children's section of the library. I always find something new and interesting. 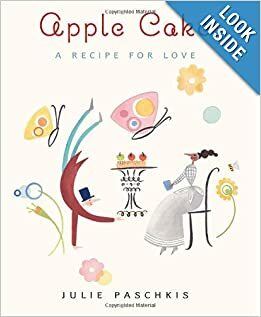 A few weeks ago I picked up the book Apple Cake: A Recipe for Love. I wasn't sure that my boys would really like it but it looked like it might be fun so I picked it up and brought it home. My 4-year-old loved it and insisted that we read it to his older brothers. And guess what? They loved it too! Throughout the book love-struck Alfonso is baking a cake to woo his love away from her books. Will it work? You'll have to read it to find out! At the end of the book you'll find Alfonso's recipe for apple cake which my boys couldn't wait to try out. It was delicious--and it got gobbled up so fast that I was only able to grab a picture of the very last slice! Grease a 9x9 inch baking dish. Preheat the oven to 350 degrees. 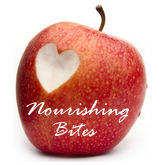 Peel and slice apples into 3/4-inch size pieces and put them in cold water. In a large bowl, beat together butter and 1 cup sugar until creamy. Add the egg and beat until it is mixed in. In another bowl, sift together flour, baking powder and salt. Add this mixture to the batter and mix well. The batter will be stiff. Shake the water off the apples and gently stir them into the batter. Pour the batter into the prepared baking dish and spread it evenly. In a small bowl, mix together 2 TB sugar and the cinnamon. Sprinkle the mixture over the cake batter. Let the cake cool for about 10 minutes. Serve warm with whipped cream or vanilla ice cream. This would be a fun read (and treat) for Valentine's day! What are some of your favorite books about love? Oh, I misread in google plus. I thought it said the Alfredo was wooing the cake away from her love. I was really interested to find out how it turned out between the pasta and the cake. Personally, I love them both! Looks fun, Jack and I will check it out.